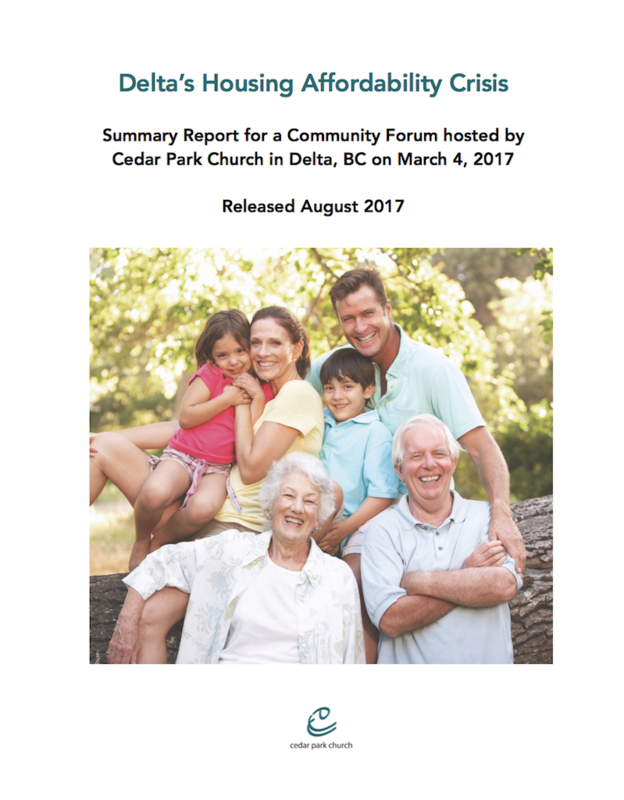 A community forum was hosted by Cedar Park Church on March 4, 2017. Are you wondering why a church hosted an event like this? It’s because living in relationship with each other is important to us. We have compiled all the community feedback that we collected at the forum. The report is available as a free download here. Feel free to share this report! If you are interested in this topic, please connect with us on our facebook page. Hans is an Epidemiologist and Health Economist who knows how tell a story with numbers. He talked about the demographics in Delta and lead us in an overview of the affordability crisis. His PowerPoint presentation is available on You Tube. Did you know that Ladner and Tsawwassen have several developments that offer subsidized rental rates for low income families? We showed a video on how housing co-ops build community. Rhonda Carriere provided information about the application process. Our second video was based on the 2016 AGM Report from the Co-operative Housing Federation of BC. This team talked to participants about Vancity’s innovative financing options for buying a home together and adding rental space. Kevin is the Mortgage Development Manager for South Delta. He grew up in Ladner and now he is raising his family in the same community. Kim is the Assistant Branch Manager of Vancity Tsawwassen. She has a strong background in residential lending and is very familiar with the trends in the local market. Kim lives in Tsawwassen. Michelle is a Ladner resident who is the Branch Manager of Vancity Tsawwassen. Her role includes focusing on social, environmental and economic issues that impact community health and wellness. Ellie shared her experience of renovating her Ladner home to create a basement suite for her elderly mother. Her mother has participated in nearly every family event and has remained active in the community well into her 90’s. Participants were able to meet Ted Andres and Luke Flaming, two local builders who do renovations. Brenda Breuls has welcomed international homestay students into her home. She shared some of the pros and cons of being a host family. We had a representative from Delta School District’s Homestay Program available to answer questions. You can also welcome adults with disabilities into your home. Two local agencies, Delta Community Living and Strive Living provided information for our participants.